The calendar year 2014 was filled with many notable moments of accomplishment, celebration and reflection at the University of Notre Dame. Here are some of them. In the wake of the 50th anniversary of the Hesburgh Library, the University began an interior renovation of the iconic building in December. This marks the first major renovation since the 14-story building was constructed in 1963. 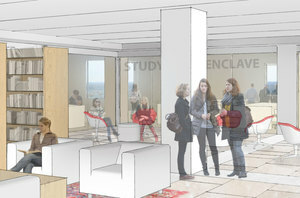 The renovation will add access to interdisciplinary and collaborative spaces, state-of-the-art technologies and advanced research expertise. In October, the University announced the creation of its first new college or school in nearly a century — the Donald R. Keough School of Global Affairs. R. Scott Appleby, a scholar of global religion and a member of Notre Dame’s faculty since 1994, will serve as the Marilyn Keough Dean of the school. The establishment of the school as well as the construction of Jenkins Hall to house it has been made possible by gifts totaling $50 million from Donald and Marilyn Keough, among the most generous benefactors in the University’s history. Rev. Dr. Ray Hammond, founder of Bethel African Methodist Episcopal Church in Boston, delivered the commencement address at the 169th University Commencement Ceremony in May. 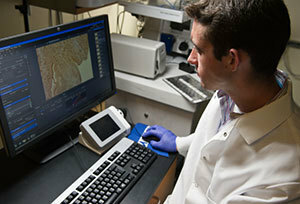 Kenneth Miller, professor of biology at Brown University, was awarded the Laetare Medal. Mark Santrach, an architecture major from St. Paul, Minnesota, delivered the valedictory address. The Mendoza College of Business took the No. 1 spot for the fifth year in a row in Bloomberg Businessweek’s 2014 Ranking of Best Undergraduate Business Schools. Recent alumnus Alex Coccia was named a 2015 Rhodes Scholar. Coccia majored in Africana Studies and Peace Studies at Notre Dame and was involved in numerous activities, including serving as student body president and competing on the fencing team. He is Notre Dame’s 15th Rhodes Scholar and first since 2002. In October, the College of Arts and Letters and College of Science announced a new collaborative major in neuroscience and behavior, which will include both bachelor of arts and bachelor of science tracks. In December, the College of Arts and Letters and the College of Engineering announced a new interdisciplinary minor in computing and digital technologies starting in fall 2015. Michelle Whaley, a teaching professor in the Department of Biological Sciences, was named the 2014 Indiana Professor of the Year by the Carnegie Foundation for the Advancement of Teaching and the Council for the Advancement and Support of Education. Gregory P. Crawford, William K. Warren Foundation Dean of the College of Science and professor of physics, was appointed associate provost and vice president of the University, effective July 1, 2015. In his new role, Crawford will be charged with developing Notre Dame’s presence in California, initially in the Bay Area. A $75 million gift from alumnus and Trustee John W. “Jay” Jordan, announced in May, is the largest in the University’s history and makes him its most generous benefactor, with a giving total of $150 million. The gift will be directed toward the creation of a world-class research program in an area of science and technology that is new to Notre Dame and that has the potential to create innovative intellectual property that has important commercial potential. Notre Dame and five public and private partners announced in June the Notre Dame Turbomachinery Facility, a $36 million project that will be the nation’s foremost research and test facility for advancing the technology used in the massive gas turbine engines used by commercial and military aircraft, power plants and the oil and gas industry. The facility will provide 60 jobs in the South Bend area and will test engine components at pressures and temperatures higher than any that exist at current U.S. university facilities. A mobile concussion app under development by researchers from Notre Dame’s Advanced Diagnostics and Therapeutics Initiative was selected for funding in a competition sponsored by the National Football League and General Electric. The research is performed in collaboration with mobile software company Contect Inc. Biologists Nicole Achee and Neil Lobo are leaders of an international $23 million research grant from the Bill & Melinda Gates Foundation, the second largest award to a single grant proposal in Notre Dame’s history. Their five-year project will generate the data required to show the effectiveness of a new paradigm in mosquito control — spatial repellency — for the prevention of two important mosquito-borne diseases: malaria and dengue fever. The William K. Warren Foundation of Tulsa, Oklahoma, made a $3.5 million gift that, combined with a previous gift valued at $6.5 million, will endow the creation of The Warren Family Research Center for Drug Discovery and Development in the College of Science. The center will be a state-of-the-art resource for a highly productive and renowned group of drug discovery faculty with expertise and interest in areas such as neurological and central nervous system disorders, infectious disease, cancer and rare diseases. In October, the University celebrated the groundbreaking for the new McCourtney Hall, a state-of-the-art research facility underwritten by a $35 million gift from alumnus Ted H. McCourtney and his wife, Tracy. McCourtney Hall is the first dedicated research building to be constructed in a planned larger East Campus Research Complex. Astrophysicist Justin R. Crepp and researchers from NASA working with the Kepler space mission have detected an Earth-like planet orbiting the habitable zone of a cool star, announced in April. While there have been other discoveries of Earth-sized and smaller planets, this is the first found that could have an Earth-like atmosphere and liquid water at its surface. In October, the Boler and Parseghian families, both with longtime ties to Notre Dame, made gifts totaling $10 million to endow the newly named Boler-Parseghian Center for Rare and Neglected Diseases. The School of Architecture announced in September the acquisition of the Seaside Archives, which details the history, planning, design and building of the first New Urbanist development of Seaside, Florida. In conjunction with the acquisition, the Hesburgh Libraries, School of Architecture and town of Seaside launched the newest phase of the Seaside Research Portal, the first virtual archive of a living community. Encompassing academics, athletics and student life, the Campus Crossroads Project, announced in January and begun in November, is the largest building project in the University’s history. 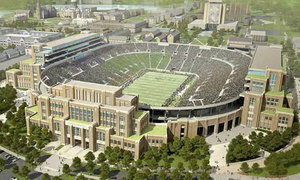 The project will add significant academic space in three buildings surrounding the historic Notre Dame Stadium and will house several departments including Music, Anthropology and Psychology, as well as new student life and recreational sports centers. The 2014-15 Notre Dame Forum, announced in September, explored the question “What do Notre Dame graduates need to know?” The inaugural event featured Carl Wieman, winner of the Nobel Prize in physics and professor of physics at Stanford University, who spoke on “Taking a Scientific Approach to Science Education.” Subsequent speakers have included Catherine Cornille, chairwoman of Boston College’s theology department; Cyril O’Regan, Huisking Professor of Theology at Notre Dame; and Richard Brodhead, president of Duke University. The Notre Dame endowment returned 19.7 percent for the year ending June 30, according to Scott Malpass, vice president and chief investment officer. The endowment pool value grew from $8.3 billion on June 30, 2013, to $9.8 billion on June 30. The Notre Dame Fire Department celebrated its 135th anniversary on Nov. 21. It is the oldest university-based fire department in the nation. The University released its first mobile app for iOS and Android systems in April. The free app is a tool for anyone to find helpful campus and local information, including an interactive campus map, news, weather, menus and more, easily on their devices. In March, the University released a new strategic plan that provides focus, transparency and accountability for its activities in the next 10 years. Named “A Legacy Expanded,” the plan builds on the five goals President Rev. John I. Jenkins, C.S.C., outlined in 2005, his inaugural year as president. In June, 25 young African leaders from 17 countries came to Notre Dame as part of the Obama administration’s six-week Young African Leaders Initiative (YALI). Notre Dame is among an elite group of colleges and universities chosen by the U.S. Department of State as a host institution for the Washington Fellowship for Young African Leaders program. The new flagship program will bring 500 students to the U.S. each year for leadership training, academic coursework and mentoring, and will create unique opportunities in Africa to put those new skills to practical use. Notre Dame once again claimed the 2014 national championship for graduating student-athletes in all sports, posting the top NCAA Graduation Success Rate (GSR) figure (99) for its student-athletes for the eighth straight year. 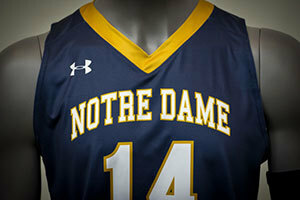 In January, Notre Dame athletics and Under Armour announced their new partnership in which Under Armour will be the exclusive designer and supplier of the footwear, apparel and equipment of the University’s varsity athletic teams. Elizabeth Tucker, a 2014 graduate and women’s soccer team alumna, was named the 2014 NCAA Woman of the Year. She is the first Notre Dame student-athlete to be selected for the honor in its 24-year history. The Notre Dame football team went to Indianapolis for its annual Shamrock Series, playing Purdue at Lucas Oil Stadium. The Fighting Irish won 30-14. The University also hosted a variety of academic and service activities in the area, including lectures, service projects and the Shamrock Series 5k Run. President Rev. 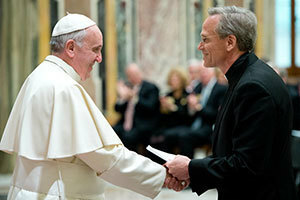 John I. Jenkins, C.S.C., shakes hands with Pope Francis. In January, a group of University leaders including President Rev. 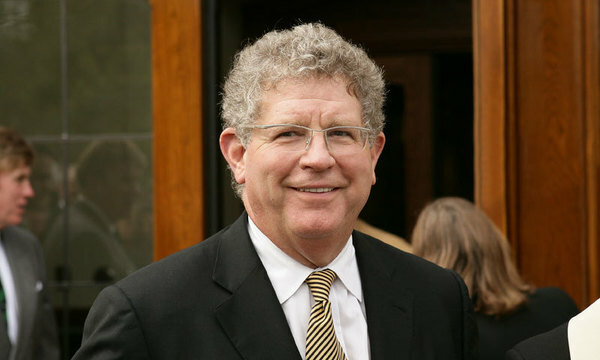 John I. Jenkins, C.S.C, exchanged messages of support with Pope Francis during a private audience in the Apostolic Palace. The week began with an academic convocation in the Notre Dame Rome Center at Via Ostilia 15, a recently renovated 32,000-square-foot building located a block from the Colosseum. The University celebrated the 200th birthday of its founder, Rev. Edward Sorin, C.S.C., with a Mass in the Basilica of the Sacred Heart on Feb. 6. In June, the Alliance for Catholic Education celebrated the homecoming of the ACE Bus, which traveled 30,000 miles to visit more than 16,000 Catholic school students across the country in the Fighting For Our Children’s Future National Bus Tour. The tour set out to raise awareness of the successes of Catholic schools and the profound impact the schools have on their students. A unique partnership initiated by the Harper Cancer Research Institute and consisting of clinical partners from The Medical Foundation, Saint Joseph Regional Medical Center and Beacon Health System will provide an individualized “molecular portrait” to local cancer patients. Mutational profiling can provide valuable information regarding potential drug treatments that may benefit an individual patient, enabling a clinical team to personalize cancer therapy. Originally published by Notre Dame News at news.nd.edu on December 17, 2014.